Chris Mahan will handprint shirts for our Holiday Party attendees next week with this new Suffer Faces artwork. 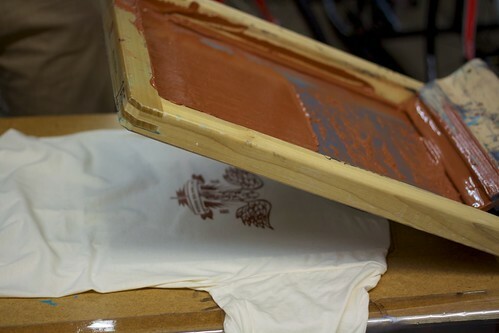 Handprinted at our Holiday Party and the cost is $15.00. This tee is a one-time, exclusive run. Click through for the full size. Show up at our party, throw your cash down, and Mahan will use his t-making machine to make you a shirt. While admiring yourself in a warm, freshly-printed shirt, drink some free beer, eat apps, and check the Biologic gear we’re bringing in for the trunk sale. Wednesday, December 7 at 6:30pm, until the keg is dry and the food gone.